Save $$ renting from a private owner in Lincoln, NH. Check our rates against the standard Nordic Inn rates. This professionally decorated condo is spacious enough for your family to really spread out and enjoy. It is also large enough for two families to share. The first floor features two large master bedrooms, each with a queen bed and full private bath. This level also has a large kitchen with stainless appliaces, granite countertops, a dining area and a fireplaced living room, with two doors leading to the lower deck. The second floor loft features sleeping for 5 with a set of bunk beds, one full bed and one twin bed. There is an additional family room on this level with a 50'' TV and DVD player, as well as another full bath. An atrium patio door leads to the upper deck. Both decks offer a majestic view of the Mountains. Also enjoy an indoor pool and outdoor (seasonal) heated pool, indoor and outdoor hot tub, full fitness facility and game room. Locker rooms include showers and saunas. We are Jeanne and Joel Karsberg, and we have three kids, Evan, Leah and Brian. We purchased this condo when the kids were little, and they all loved to ski. Since that time, we have all learned to snowboard as well, and we absolutely love the Lincoln area. My kids have had the opportunity to be out on the mountain with their friends, and my husband and I have had the opportunity to make some great friends. We love the Lincoln area year round since there is so much to see and do. We hope you will feel at home in our condo, and make many wonderful memories here. We purchased this condo because we fell in love with the area. We were originally looking for a seasonal rental, and decided to make it permanent because we wanted to give our children the experience. Since every season in Lincoln is special, we decided that winter just wasn't enough. We have not regretted our decision for an instant. We love this unit because there is so much room for everyone to spread out and enjoy themselves. With three full bathrooms, we never feel rushed in the mornings. The kids have the entire loft to themselves, complete with a large TV and outdoor deck. The adults can share some quiet time downstairs in their own living room area, or out on the porch. There are televisions in each bedroom, as well as in the living room and the 50' flat screen in the loft. All bathrooms feature a full bathtub and shower. All towels and linens are provided. Beach towels also provided for spas, pools and lakes/rivers. We provide starter Paper Towels and Toilet Paper. You may need to purchase more during your stay. We provide dish detergent, laundry detergent and hand soap. We do our best to keep them stocked, but please check to make sure there is enough for your stay. We try to keep basic spices for guest use. We also keep basic condiments in the fridge. Beautiful condo!Perfect location!! Lot of space!!! Perfect spot for a White Mtn getaway!! I was very happy with the condo and amenities. We went up with our family of 4 (including a 4 year old) and our friends family of 5. This condo was perfect, it was clean when we arrived and even better than we expected. The location is perfect where you can walk to the restaurants and stores in Lincoln or jump on the Kancamagus and go explore! We had a bit of rain but the boys made the best of the game room and got pretty good at Ping Pong! Both inside and outdoor pools were nice and never overcrowded! We enjoyed several meals in the condo (pots and dishes there made this super easy) and also enjoyed the local cuisine! We loved it here and will definitely be back to visit! Beautiful apartment in a great area of Lincoln. Very clean, well decorated apartment that makes you feel totally at home. Has everything you need and provides lots of space for 5 or more people. Easy walking distance into town for shops, restaurants etc. Facilities in the complex are great with games room, gym, indoor and outdoor pool. Well located to reach any and all attractions in the white mountains area. Would stay here again for sure. Thank you so much for you nice review. I am so happy to hear that you enjoyed your stay, and took advantage of all that Lincoln has to offer. I am sure you were happy for the AC during this hot and humid week. I hope you had the opportunity to jump in the river across the street. It is so refreshing during these heat waves. We hope you will return to the area and stay with us again. Even though the weather was pretty awful with almost constant rain, we used our ponchos and trudged through it. The location of the condo was perfect, close to everything we wanted to see, and the town had a lot to offer. The condo was clean,set up well, and had everything we needed to prepare meals. The pools, hot tubs, game room, etc. were all in tip top shape. Jeanne made this a very easy thing to do, and she was very responsive to any questions. We highly recommend this to everyone. Thanks for your kind words Steve. So happy our home worked well for you and your family. I hope you are able to come back again and enjoy the area in better weather. Although there is still a lot to do in the area, nothing beats its beauty in nice weather. Had a great time. The condo was beautiful and roomy. We were close to everything including Loon Mountain,great restaurants, and the Kangamangus Highway. Thanks for everything!! Thank you for your positive review. We are so happy to hear you enjoyed your stay. We love sharing our home with families like yours. The White Moutains are such a wonderful place to visit at any time of the year. Many think of it as only a winter/skiing destination, but there is so much more to explore. Glad you got to experience all of that first hand! Enjoy hiking, biking, snowmobiling, rock climbing, polar caves, waterfalls, kayaking, gondola rides, horseback riding, rafting, skate parks and more. Close to many family activities including Whales Tales Water Park, Santa's Village, StoryLand, Clark's Bear Shows, Hobo Railroad, Lost River, The Flume Gorge, and many more. Loon Mountain is just minutes away, and a complimentary ski shuttle is available to pick you up and drive you right to the lodge. No need to park your car and hike with all your equipment. 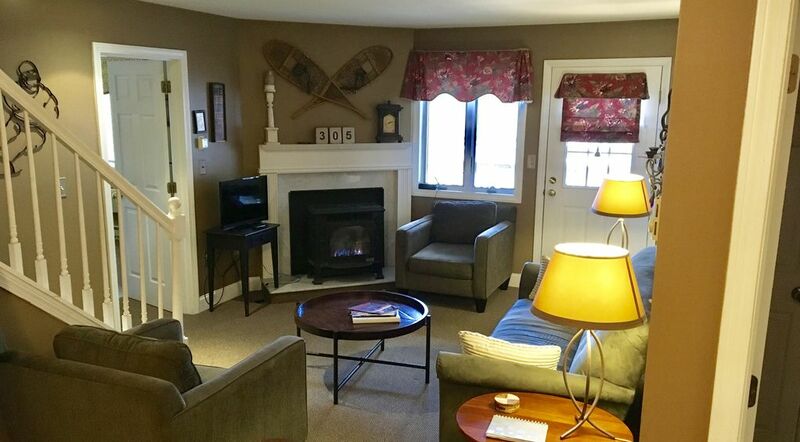 (ski season only) After a fun day on the mountain, relax in the indoor or outdoor hot tubs, spend some time in the game room, or just sit by the fire. There is plenty to do for all ages at the Nordic Inn. Outlet shopping is North Conway is a short drive down the scenic Kancamangus Highway. The Lincoln/Woodstock area also offers live theatre, a dinner train, and fine eateries and taverns, many with live music and dancing.